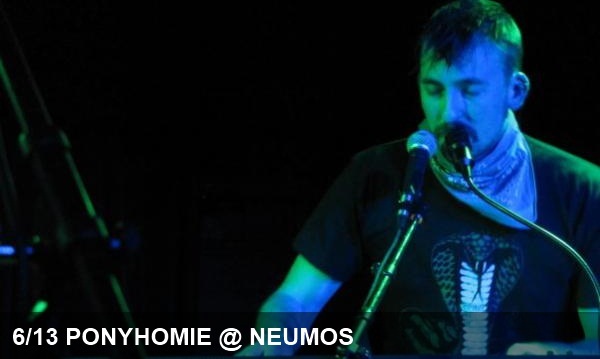 With his trademark talk-sing delivery and intricate lyrics, tonight’s Neumos headliner has been a critical darling and fan favorite since the early 1990’s. 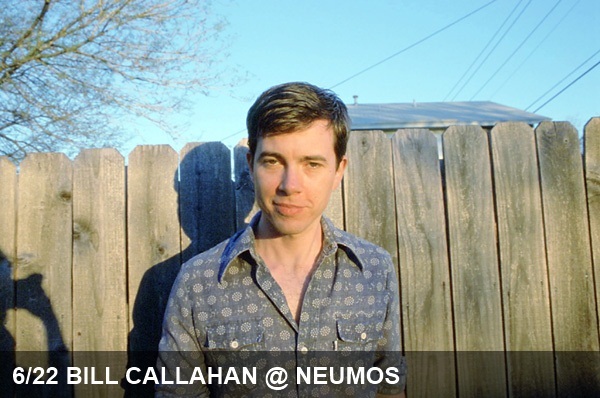 Having hung up the moniker of lauded solo outfit Smog, Bill Callahan returns to Seattle to promote Apocolypse, his third and latest release under his own name. Head to Neumos early to see opener Michael Chapman, the legendary British songwriter who’s been writing and performing for nearly 50 years. While we usually try to keep our recommendations to the absolute best activity of the evening, there are many nights when the cornucopia of audio choices can’t be narrowed down to a single pick. As it turns out, tonight’s one of those nights. After much deliberation, we’ve pared our picks down to two bests, both who happen to be newer additions to the Seattle music scene. Pickwick at Tractor Tavern. As the one of the most buzzworthy blue-eyed soul groups of the latest funk/soul revival, Pickwick are sure to have the crowds swooning, swaying and having a great time in general. 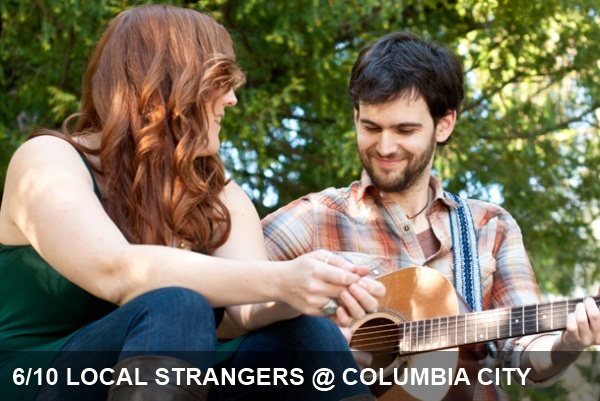 Regardless of your choice, you’ll end up seeing one of Seattle’s best up and coming acts. If you’re looking for groups whose tunes have been taking up residency in your iPod for years, there’s plenty of great choices there as well. If you’re feeling more sentimental, consider Blue Scholars at Neumos, Kid Cudi at WaMu Theater, Face to Face at the Showbox, Bell X1 at the Croc or Grant Hu of Husker Du at the Funhouse. Live From The Basement – Pickwick from Sound on the Sound on Vimeo. While our home metropolis may have lost the long-held title of most literate city to D.C. this year, it’s no secret that Seattle denizens appreciate the beauty of deftly constructed prose like few others. As such, it should come as no surprise that so-called hyper-literate-rock shows are among the city’s most beloved musical events. 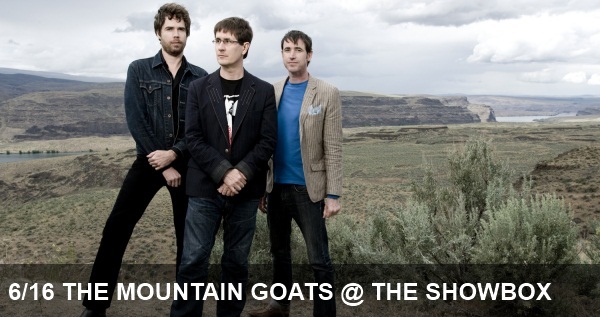 In February, we wrote about our excitement in advance of indie rock poet laureate John Darnielle’s solo show at UW and today, we’re excitedly typing about his return with his solo outfit turned band, The Mountain Goats. Head to the good Showbox tonight to hear some great lo-fi, narrative-driven folk from the band that often turns phrases so clever that they leave the likes of Colin Meloy and John K. Sampson (and their respective “The” bands) at a loss for words. If you have a case of the Mondays (we certainly do), then do we have a show for you! We’ve said it before and we’ll say it again: PonyHomie is one of our favorite local bands. 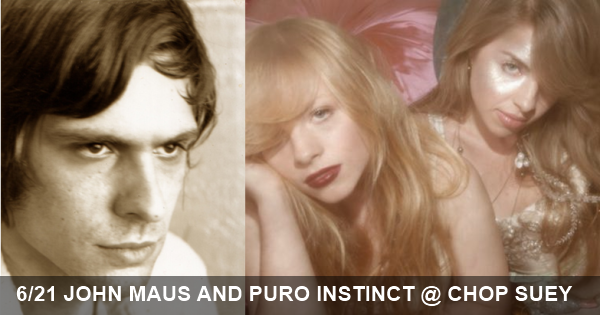 They’re coming into their own – last time they played Neumos they were opening, but tonight they are the headliners. PonyHomie is being supported tonight by MK Speeddial, Fever Teeth and Silly Goose. Come out and party like it’s still the weekend. Dinner theaters are generally thought of as a thing of the past. Along with vaudeville. However, put those two together, and you have tonight’s show. 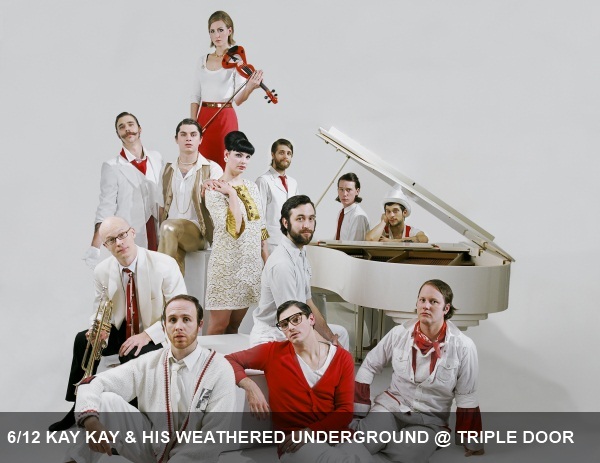 Kay Kay & His Weathered Underground will perform at our city’s finest dinner theater, The Triple Door. The troupe of local musicians playing 1920’s style indie pop, complete with muted trumpets, vintage microphones and a standup bass. We’ve always loved seeing Kay Kay, so get gussied up for a night on the town with the person you’re sweet on, order some delicious Thai food, have a couple cocktails that would make those in charge of the Prohibition shudder, and enjoy some incredible music. We usually write about shows that are solely in Seattle proper, however sometimes we find shows in the surrounding areas that deserve a post of their own. Not all of our readers live in Seattle per se, and the music scene from Seattle tends to seep into many of the nearby suburbs. Tonight, we’re happy to highlight the quaint town of Bremerton, home to several musicians that put Washington on the musical map, including MxPx. 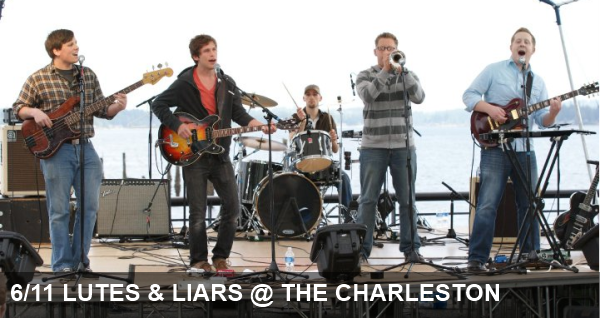 A relatively new band, Lutes & Liars, is celebrating their album release at The Charleston tonight in Bremerton. Formerally known as The Troubadours, Lutes & Liars play feel good indie pop that both tugs at your heartstrings and makes you want to dance. If you’re on the other side of the water from Seattle, or don’t mind a gorgeous ferry ride, catch Lutes & Liars with Handsome & Gretyl and Homeless Man. Some artists are catapulted into the spotlight thanks to movie soundtracks. The Shins partly have Zach Braff to thank for their rise to fame. 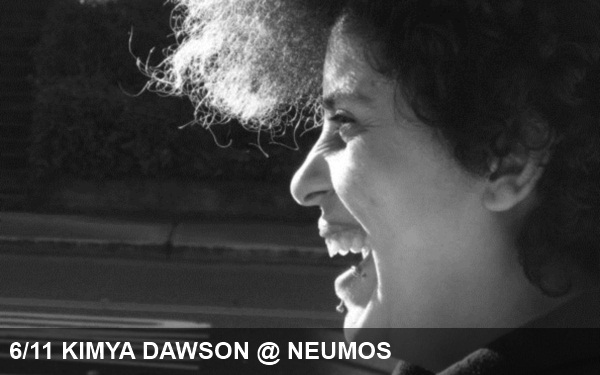 Another recent example of such a musician is Olympia’s own Kimya Dawson, formerly of the band The Moldy Peaches. Thanks to the movie Juno, Kimya has become somewhat of a household name. Known for her absurd yet shockingly honest lyrics, as well as her wild hair, ubiquitous tattoos and lip piercings, Kimya has an understated stage presence that commands the attention of even the most restless bar crowd. Her music sounds relatively simple, with rudimentary guitar chords and her unconventionally pleasant voice, however her folk songs are emotionally jarring and complex. Flanked by musicians who are a little more hifi and raucous than she, Kimya will be at Neumos tonight with Aesop Rock, Rob Sonic and DJ Whiz. We try to narrow down the shows happening in Seattle on any given evening to one or two to make it a little easier for you to decide what to go out and see. Tonight is one of those nights where we just can’t cut down the list that far. Below we’ve highlighted three can’t miss shows happening this evening throughout the city! We recommended Portland’s The Builders & The Butchers when they were in Seattle in February, but they’re back and we can’t resist. Their brand of Americana is chock full of macabre imagery and skillful instrumentation, and lead singer Ryan Sollee’s falsetto vocals are excellent. The band is known for their engaging shows, so head down to the Tractor tonight for their set, which also benefits Noise for the Needy. They’re garagey. they’re raw, they’re Fox & The Law. 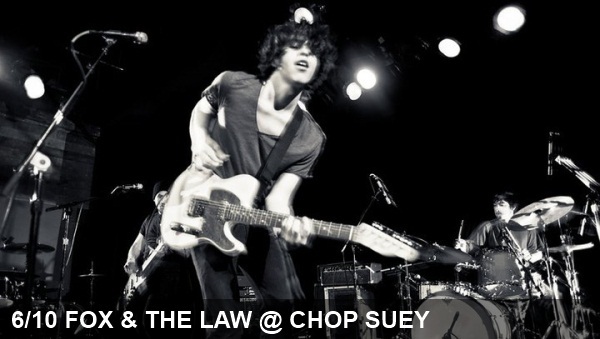 If you’re in the mood to let your hair down and rock out tonight, head over to Chop Suey for a rowdy, lo-fi set from these Seattle natives. We’re big fans of world music (we know we aren’t the only ones blasting the Wo’ Pop show on KEXP). While our tastes are usually fairly “western,” a fascinating act is coming by Neumos tonight that you simply cannot miss. 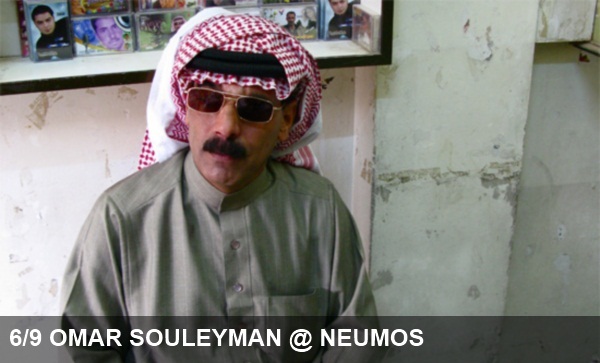 Omar Souleyman is a renowned Syrian pop star. With hundreds of small projects and several solo studio albums, he’s taking the middle eastern musical genre by storm. Omar combines traditional Syrian folk music with spastic, erratic electronic effects for a truly one-of-a-kind sound. Don’t let his shades and turban fool you – the guy is a musical mastermind. He’s pretty much the Syrian equivalent to MIA, and he’s ready to build up his US fanbase. This will truly be a show unlike any other – a must-see in our books!